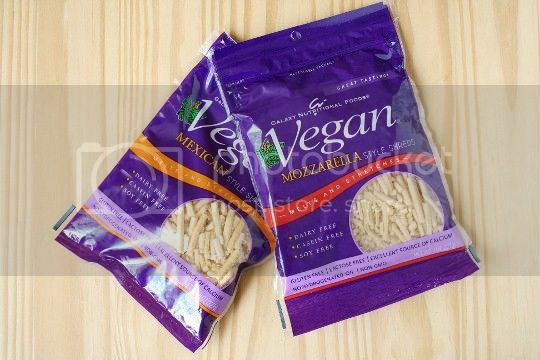 Galaxy's newest item is vegan shreds, in both mozzarella and Mexican flavors. The texture is half shreds, half crumbs...but it all melts together in the most fantastic, bubbly, ooey gooey faux cheese you've ever seen. 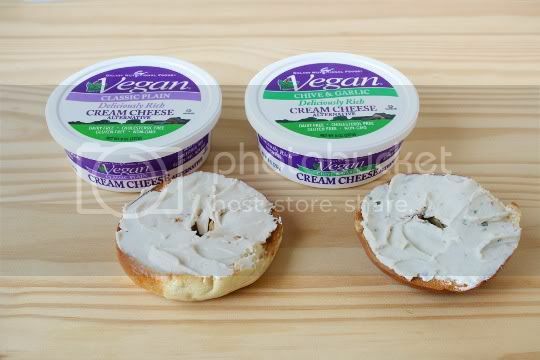 Currently, these are the only two flavors available, but here's a suggestion to do the first vegan blue cheese! 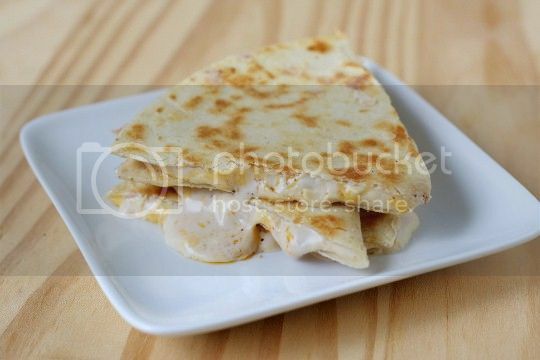 I tried the Mexican style first...and what's a better Mexican recipe for cheese than a quesadilla? I wanted to truly taste the cheese for itself, and not add in a bunch of other ingredients, so I simply added some to a tortilla in a pan and melted away. And melt it does...quickly. After only a few minutes, I could see the cheese beginning to ooze out of the tortilla edges, looking just like the real thing! The only problem was it kept melting, even after I removed it from the pan. So as you can see from the picture, it turned into more of a creamy cheese sauce (which made eating very messy!). The texture is thick, sticky, and gooey, and the flavor is salty with a very slight sweet aftertaste. This seemed more like American cheese than anything specifically Mexican, but still decent overall. Okay, so maybe I wasn't totally in love with the quesadilla application. But pizza? Oh yes. If only you could have seen how this stuff bubbled up in the oven, looking absolutely gorgeous and oh-so-cheesy. The thick, sticky, gooey texture is the same, however I noticed it stuck to the roof of my mouth and teeth this time. Not a bad thing necessarily, just an ode to its true gooeyness! I thought it tasted very similar to the cheese found on those cheapie frozen pizzas (remember Mama Celeste?! ), and again, that's not a bad thing. Similar to Daiya, I found it was more creamy than really stretchy when melted, but the flavor was enough to outweigh any complaints. 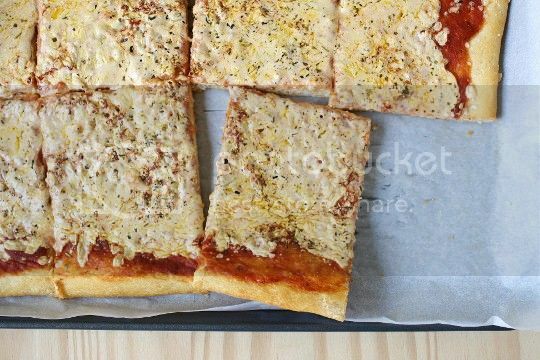 Salty, savory, and just enough flavor without being too fake, this is definitely a go-to for future pizza making. Smooth and spreadable, rich and thick. Galaxy knows the one ingredient that's gained recent popularity among the vegan community--coconut oil--and has acted accordingly. Yes, a coconut oil-based cream cheese that is healthy, flavorful, and simply amazing. It's buttery in flavor and texture and isn't soy-based, and don't worry, there's no hint of coconut flavor. Ingredients are simple without any crazy chemicals you can't pronounce, just oils, seasonings, and various "gums" for texture. It's already nice and soft, but it mixes well with other things, so it's great to use in any of your favorite dip or spread recipes. Currently, there are two flavors available (listed below), but I'm hoping Galaxy has plans for more! 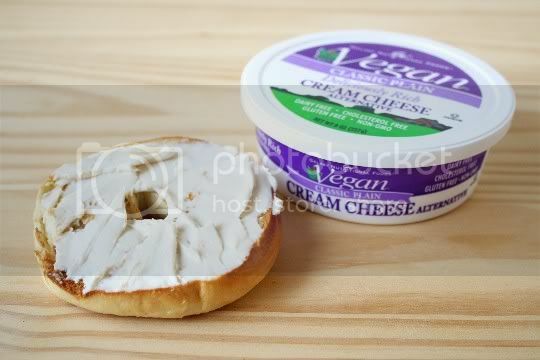 Strange thing, that vegan cream cheese. Like a couple other brands I've tried, this has sort of an "interesting" aftertaste on its own. But then spread it on a bagel or piece of toast, and that aftertaste is completely gone. While I'm on the subject of aftertastes, there is no soy or tofu flavor, which is a great thing (especially if you want to introduce this to non-vegans). The Classic Plain is slightly salty and a little sour, just like cream cheese should be. A long time ago, I tried a brand of vegetarian Parmesan that was absolutely detestable. It's still on the market. It shall remain nameless. Since then, I gave up on trying actual substitutes and just used nutritional yeast and similarly based products instead. While I eventually grew to enjoy the taste (I do think it's acquired), I never REALLY thought it was a TRUE substitute. How silly of me not to have tried the Galaxy version first. It is AMAZING. It's soy based, but you can barely tell. I don't know what they do to this stuff, but it is literally just like real Parmesan. It has that delicious tangy, aged umami flavor, and it's salty and even a bit sweet. 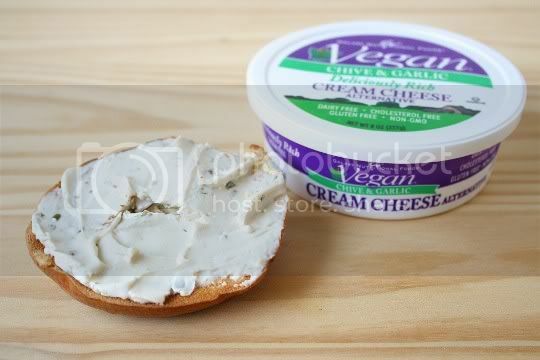 Like the Classic Plain Cream Cheese, it has a bit of an aftertaste on its own, but again, that completely disappears once it's on food. I made some garlic bread using Earth Balance, sprinkled the Galaxy Parmesan on top, and stuck it under the broiler for a few minutes. What first amazed me was to see that it actually melted in with the Earth Balance. It melts! 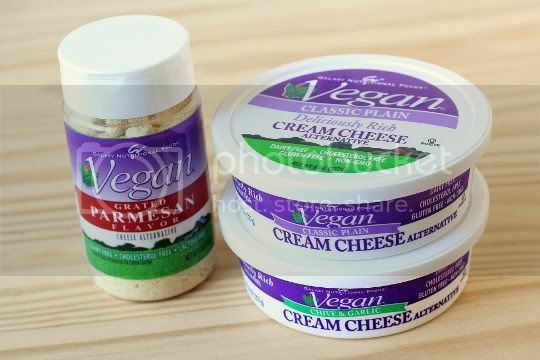 What a great discovery for future veganized alfredo sauces, lasagnas, and other pasta dishes. Of course, I sprinkled even more on top of the broiled garlic bread, and it was gone within minutes. 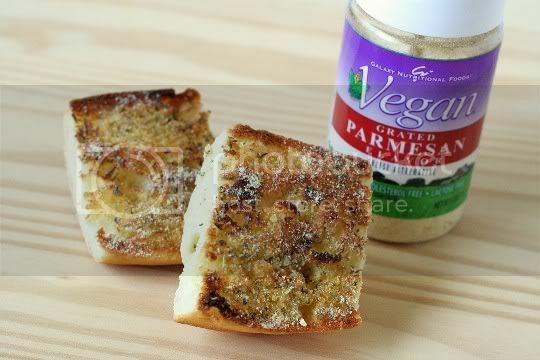 This has without question become my Parmesan sub go-to for the future! Galaxy is continuing to make delicious and easily obtainable (they're in most major grocery stores!) products. I'm looking forward to more!